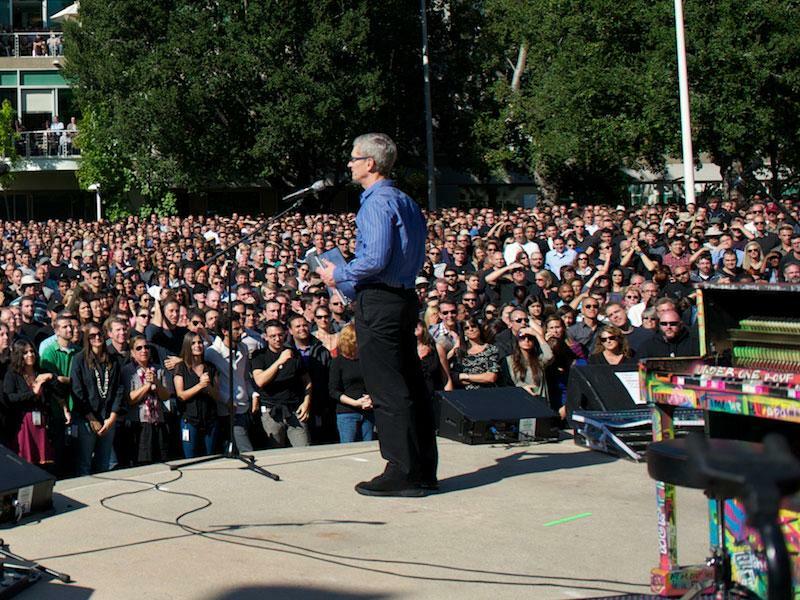 Thousands of employees gathered at Apple's corporate campus in California for a tribute to the late Steve Jobs, while even more retail employees watched a live stream of the event as their stores closed [updated photos]. Stores were covered with white sheets on Wednesday to keep the event secret. 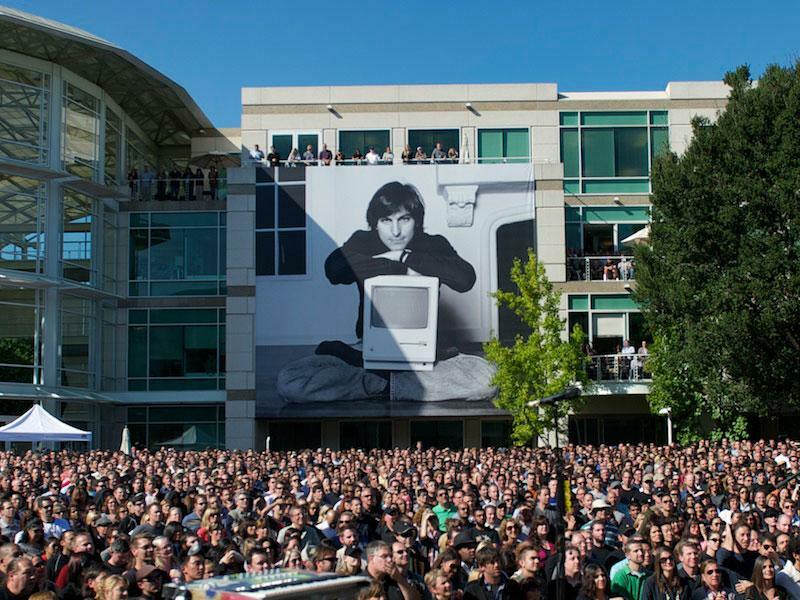 Inside, employees watched a live feed of an event at an outdoor amphitheater in Cupertino, Calif., celebrating the life of Jobs. The event runs from 10 a.m. Pacific to 11:30 a.m. As it got underway, footage from a news helicopter shown on CNBC revealed thousands of people participating in the event. From above, it could be seen that giant banners showing the face of Jobs were prominently displayed at the event. One AppleInsider reader sent word that Coldplay and Norah Jones also performed. Only employees were allowed to attend the event live in California at 1 Infinite Loop. Security at the company's corporate headquarters reportedly asked reporters not to approach Apple employees coming to or leaving the campus. Because of the large number of employees attending the event, Apple recruited sheriff's deputies to help direct traffic. Earlier Wednesday, Apple published a new section on its website called "Remembering Steve." It features some of the more than one million messages sent in by those mourning the loss of the Apple co-founder. 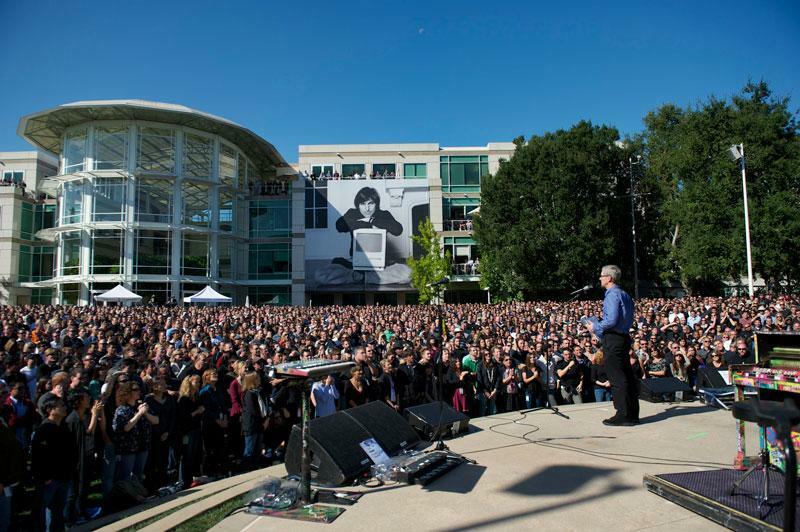 While Wednesday's tribute is for employees at Apple, a memorial featuring friends, family and colleagues was held on Sunday, featuring people such as Google CEO Larry Page, former U.S. President Bill Clinton, actor Tim Allen, and a performance by U2 lead singer Bono.